On Friday I left work early because I finally completed and submitted my big DOE proposal (102 pages, 4 partners, $5.7M, 3 years). Just as I got home, there was a page out for a mission on La Luz. I got the rig, joined Team 2, and met the police about 4 miles up the trail. The unpleasant business of performing body extractions is part of what AMRC does. As always the crew stepped up and got the gentleman out of the wilds with a lengthy wheel out. Because I was teaching the Operational Core Curriculum (OCC) class for the new AMRC members the next morning, I left the rig at my house overnight. I wonder what the neighbors thought? In the morning, I was in charge of teaching the OCC raises and lowers. We covered the main and belay, litter rigging, and communications. Overall everyone was very attentive and excited to be out at white wash for the day. We did 3 1/2 lowers/raise transitions and then a low angle exit with a knot pass. Fun times with the newbies! 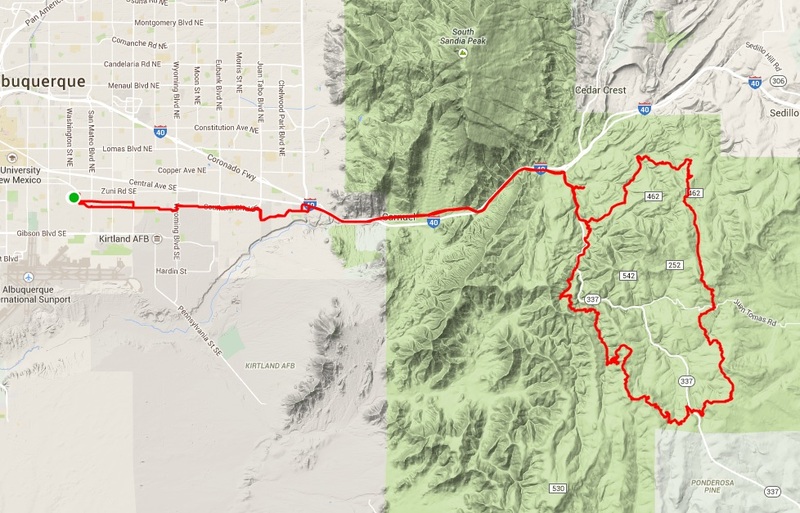 Sunday, I woke up with the crazy idea of riding the Manzano Monster Loop from my house. Powered by a couple cold slices of pizza, I suffered the thing out over ~6 hours. It wasn't so bad except I managed to endo right away on the descent to Otero and badly bruise the palm of my right hand. That made the remaining 25 miles of dirt pretty painful. Then I stopped in the AMRC cache to get more water. The winds weren't insane, but it still hurt coming home through the canyon. 57.5 miles and 4,676 ft on knobby tires!